Spacecraft, the space environment , and weightlessness itself all impact human physiology. Clean air, drinkable water, and effective waste collection systems are required for maintaining a habitable environment. Without the Earth's atmosphere to protect them, astronauts are exposed to a much higher level of radiation than individuals on the Earth. Weightlessness impacts almost every system in the body, including those of the bones, muscles, heart and blood vessels, and nerves. Bone loss, especially in the legs, is significant during spaceflight. This is most important on flights longer than thirty days, because the amount of bone lost increases as the length of time in space increases. Weightlessness also increases excretion of calcium in the urine and the risk of forming kidney stones . Both of these conditions are related to bone loss. Many nutrients are important for healthy bone, particularly calcium and vitamin D . When a food containing calcium is eaten, the calcium is absorbed by the intestines and goes into the bloodstream. Absorption of calcium from the intestines decreases during spaceflight. Even when astronauts take extra calcium as a supplement, they still lose bone. On Earth, the body can produce vitamin D after the skin is exposed to the sun's ultraviolet light. In space, astronauts could receive too much ultraviolet light, so spacecraft are shielded to prevent this exposure. Because of this, all of the astronauts' vitamin D has to be provided by their diet . However, it is very common for vitamin D levels to decrease during spaceflight. The changes in bone during spaceflight are very similar to those seen in certain situations on the ground. There are similarities to osteoporosis , and even paralysis . While osteoporosis has many causes, the end result seems to be similar to spaceflight bone loss. Paralyzed individuals have biochemical changes very similar to those of astronauts. This is because in both cases the bones are not being used for support. In fact, one of the ways spaceflight bone loss is studied is to have people lie in bed for several weeks. Using this approach, scientists attempt to understand the mechanisms of bone loss and to test ways to counteract it. If they can find ways to successfully counteract spaceflight bone loss, doctors may be able to use similar methods to treat people with osteoporosis or paralysis. Loss of body weight (mass) is a consistent finding throughout the history of spaceflight. Typically, these losses are small (1 percent to 5 percent of body mass), but they can reach 10 percent to 15 percent of preflight body mass. Although a 1 percent body-weight loss can be explained by loss of body water, most of the observed loss of body weight is accounted for by loss of muscle and adipose ( fat ) tissue. Weightlessness leads to loss of muscle mass and muscle volume, weakening muscle performance, especially in the legs. The loss is believed to be related to a metabolic stress associated with spaceflight. These findings are similar to those found in patients with serious diseases or trauma, such as burn patients. A decrease in the mass of red blood cells (i.e., the total amount of blood in the body) is also a consistent finding after short- and long-term spaceflight. The actual composition of the blood changes little, because the amount of fluid (blood plasma ) decreases as well. The net result is that the total volume of blood in the circulatory system decreases. While this loss is significant (about 10 percent to 15 percent below preflight levels), it seems to be simply an adaptation to spaceflight, with no reported effect on body function during flight. Astronauts on the International Space Station prepare to share a meal. The quality of their menu contrasts sharply with those of the early space explorers, whose meals were either semi-liquids—squeezed from a tube—or bite-sized cubes. 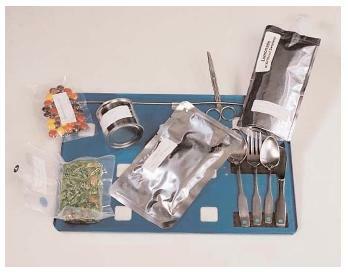 A Space Shuttle meal tray includes scissors to cut open food packages and Velcro to hold them in place. The tray itself is secured to the wall or to an astronaut's lap to keep it from drifting away. Dietary intake has been monitored on select Apollo, Skylab, Shuttle, and Shuttle-Mir flights as a part of scientific studies. Preflight and postflight intakes are determined using conventional methods for dietary assessment . Crew members are provided a diet-record logbook and digital scale, or the foods are weighed by the research dietitian and provided during each of the five- to eighteen-day data collection sessions. A variety of nutrient-analysis software programs are used. Crew members record their intake during space-flight by writing it in a log or, more frequently, they use a barcode reader that scans the food package label and then record the amount consumed. The amounts of certain nutrients in each meal are calculated from the record of how much of each type of food was eaten, plus knowledge of the amount of each nutrient in each type of food. Nutrient calculations using chemical analysis data for each spaceflight food item are performed after the flight. On the International Space Station, crew members complete a food-frequency questionnaire each week, and the data is down-linked for analysis. Dietary intake can thus be assessed in real time. Changes in diet may then be suggested to the crew members to prevent nutrient deficiencies. A primary concern is that astronauts consume enough energy ( calories ) for optimal work performance and good health. Of the flight crews that have been monitored, only the Skylab crew members consumed enough energy—99 percent of their predicted intake. Most of the crew members in other flight programs consumed about 70 percent of what was planned. 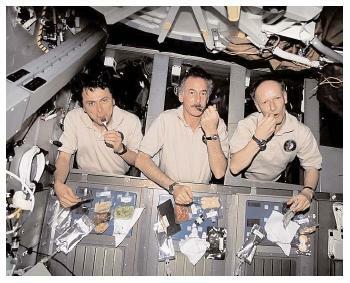 On the Skylab flights, much time and attention was given to eating and food preparation, and the crew members' extensive exercise program may have stimulated their appetite. On all other flights, the crew members have had a very busy schedule, with little time and attention devoted to eating. SEE ALSO Nutritional Deficiency ; Osteoporosis .